1. Shutdown looms: There is a very real possibility that the United States government will be forced to shut down at midnight. But investors don't appear to be too worried. House Republicans approved a bill late Thursday that would keep the U.S. government running until mid-February. But Democrats in the Senate, some of whose support is needed to pass the measure, appear poised to take a stand. Democrats, who have been frustrated by a lack of progress on immigration, are hoping to extract concessions in return for their votes. Market reaction has so far been muted. 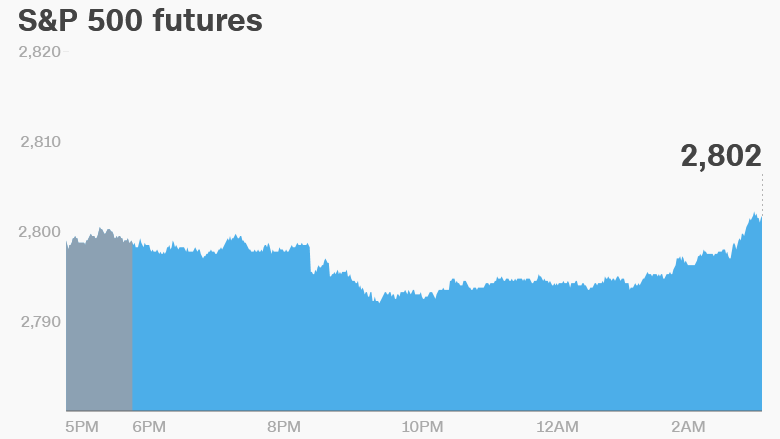 U.S. stock futures were steady on Friday, and most global markets posted gains. A brief government shutdown is not expected to have a large economic impact. But it could hurt investor, consumer and business confidence because it signals a major breakdown in the political process. "The economic damage of a shutdown should be limited, if the shutdown is relatively short lived ... A longer slowdown would start to do more serious damage," warned Paul Donovan, global chief economist at UBS Wealth Management. 2. Stocks to watch -- IBM, American Express: Shares in IBM (IBM) and American Express (AXP) could stumble on Friday. IBM reported its first sales increase in 22 quarters after the market closed on Thursday. Sales grew 1% last quarter, but that might not be enough to convince investors that IBM has turned its fortunes around. Shares were down by as much as 4% after the market closed on Thursday. American Express shares were also lower in extended trading after the firm posted its first net loss since 1992. The company said the recent tax code overhaul was the culprit. American Express estimates that it will face a $2.6 billion "charge" because of the new law, most of which will go toward a tax on profits earned overseas. 3. Hotels halted: Trading in Wanda Hotel Development was halted in Hong Kong, and investors are waiting for news about the potential sale of a business unit. Wang Jianlin, who heads up the Wanda real estate and entertainment empire, is among China's richest men. Wanda has been scaling back parts of its sprawling operations after coming under heightened scrutiny by Chinese authorities last year. 4. Earnings: SunTrust Banks (STI) and Schlumberger (SLB) will release earnings before the open.